It came to my attention that AdBlock Plus (Firefox, Opera and Chrome extension/add-on) as of version 2.0 (released December 14, 2011) allows some ads to be displayed. It calls these ads “non-intrusive” and includes a TON of Google URL’s that are allowed (and here is why, $$$). Something you definitely don’t want if you care about your privacy. Rather than letting people opt-in, it is enabled by default so you have to opt-out. I have only been using Firefox for about a week so I did not know about this feature when I recommended AdBlock Plus. AdBlock for Safari does not show these ‘non-intrusive’ ads so should block everything still. Hopefully those of you that have been using AdBlock Plus knew about this feature already. If not, then Google and other companies in this list, have still been able to track you since December 2011. Those of you that installed it as per my recommendations should disable this feature immediately or switch to AdBlock Edge. Even though Little Snitch or your firewall content filter may have been taking care of Google URL’s, little tricks like this make me instantly lose faith in a vendor/brand so I switched to AdBlock Edge. 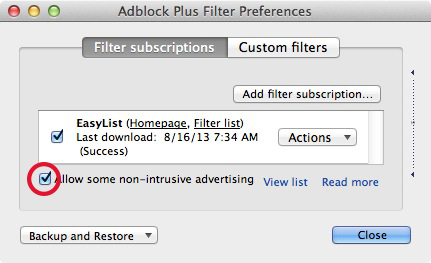 From the Tools menu go to “Add-ons”, find the AdBlock Plus extension and click on it’s “Preferences” button. In the preferences you’ll see a button labeled “Filter Preferences…”, click that and in the window that opens, disable (un-check) “Allow some non-intrusive advertising”. If you want to replace AdBlock Plus with an ad blocker that actually blocks all ads, switch to AdBlock Edge. It looks and feels the same as AdBlock Plus so there is no learning curve, just copy whatever custom filters you set in AdBlock Plus over to Edge and you are good to go. Firefox may act a little weird with both add-ons enabled so once you disable and remove Plus and have just Edge enabled, restart Firefox and you’re done. You can read more about AdBlock Edge and download it here. How do you add the last subscription to ABE? In the Filter Preferences click on the “Add Filter Subscription” button (not custom filters), then the text link “Add a different subscription”. Ignore the list of presets and just add your own description and put the URL in the ‘filter list location’. This should work for all filter lists. I have not done anything with Custom Filters so not sure if there is an easier way to do it through there.